“Let me turn then to the current stance of monetary policy. Five years ago, in October 2007, the Federal Reserve had under $900 billion of assets, mostly in the form of short-term Treasuries. It was targeting a fed funds rate—the short-term interbank lending rate—of just under 5 percent. Five years later, the Federal Reserve owns nearly $3 trillion of assets, mostly in the form of long-term government-issued or government-backed securities. It plans to buy still more over the remainder of 2012. It has also been targeting a fed funds rate of under a quarter percent for nearly four years—and anticipates continuing to do so through mid-2015. In the language of central banking, the Fed’s policy stance is considerably more accommodative than it was five years ago. Some observers argue that the Fed has done too much, has been too accommodative. I strongly disagree. These critics are certainly right that the Fed’s actions—tripling its balance sheet and keeping the fed funds rate near zero for years—are historically unprecedented. But it is also clear that the economy has been hit by the worst shock in 80 years. Over the past five years, Americans have lost jobs and a great deal of wealth. Relative to 2007, people remain uncertain about future employment and income. Businesses, too, are less certain about future demand for their goods. These changes and uncertainties make firms and households less willing to spend, and so push down on both employment and prices. In order to fulfill its dual mandate of promoting price stability and promoting maximum employment, the FOMC must offset these adverse shocks by making monetary policy more accommodative. I used to think Kocherlakota had no clue about monetary policy. I was obviously completely wrong – Kocherlakota is very clearly one of the most clever fed voices around. PS Scott Sumner also comments on Kocherlakota. Sandy is BAD NEWS. The two graph version. “It’s a good thing I shaved my head this morning or else I’d be tearing out my peach fuzz with my fingernails thanks to the plethora of broken windows fallacies being bandied about in the media today. 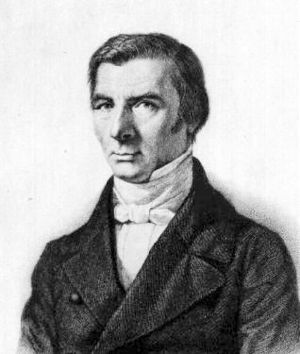 If you think Sandy is “good for the economy,” you are hereby remanded to my Econ 100 class (and ordered to read endless Bastiat) and I expect to see you cheering the next disaster that kills people because it boosts the demand for funeral homes and cemeteries. I got more hair than Steve, but he is spot on. It is unbearable to hear the stories about Sandy being good news for the US economy. Sandy is horrible news – for the the victims and for the US economy. Any other view is bordering idiotic. Here is the two graph version of Sandy. Sandy is a negative supply shock and not a positive demand shock (that is what the journalists – and some keynesians – apparently fail to understand…). Sandy destroys production resources and disrupts production. 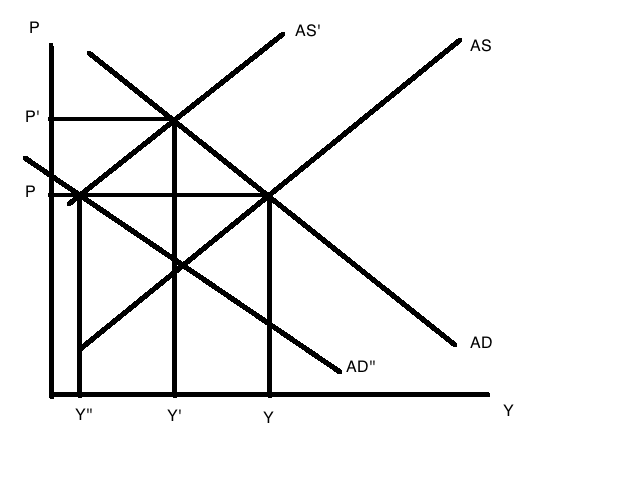 That shifts the AS curve to the left (from AS to AS’) and reduces productions (from Y to Y’) and increases prices (from P to P’). That’s not good news. That is BAD NEWS. But it could be worse! 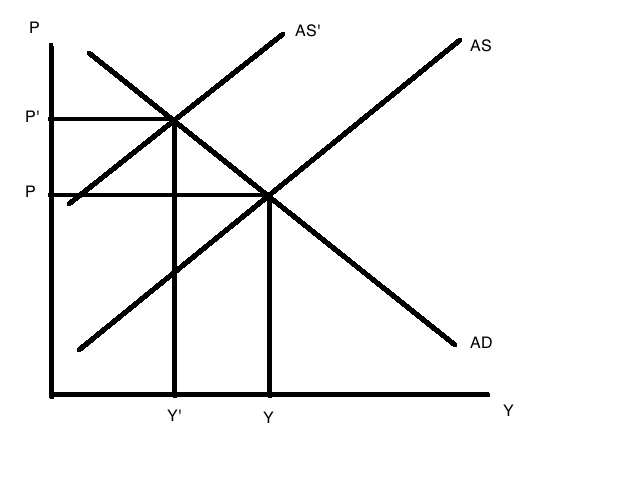 Imagine you have a inflation/price level targeting central bank that targets prices at P. Then it would tighten monetary policy and shift the AD curve to the left (to AD”) – maintaining prices at P and reducing production to Y”. This is what would have happened if Sandy had hit Europe. Yes, the ECB would have tightened monetary policy in reaction to Sandy – just remember what the ECB did in 2011 after the Japanese tsunami. Update: I decided to add a picture to this post – this guy knew about the “Sandy fallacy”. 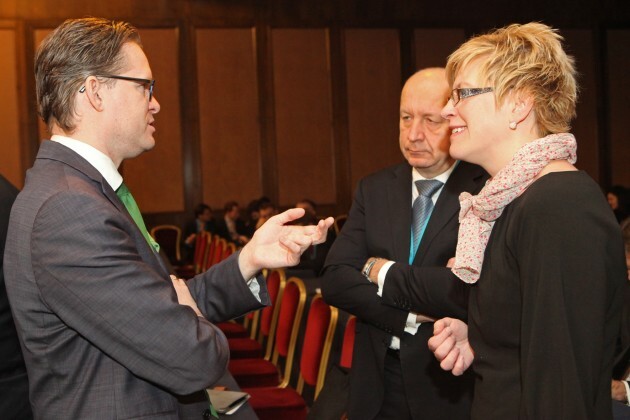 I am in Lithuania at the moment and today I spoke at the Baltic Investment Forum. Here is a report on what I said – it is mostly a fair description of what I actually said. If you don’t bother to read the conclusion is the following: Easier monetary policy, fiscal consolidation and structural reforms. PS Richard Koo and I had a great debate about the crisis. Richard believe we are in a balance sheet recession and we need expansionary fiscal policies to get us out of the crisis, while I believe in monetary easing. Lets just say we did not agree on anything. Read Scott’s paper – the important thing is that we are making inroads with our “natural allies” – libertarians and conservatives. Dear friends if you like to read my blog posts you will have to thank Scandinavian Airlines for this one. I am stuck in Heathrow Airport for now. Cancellations and delays of my flight from London to Copenhagen mean that this has been a rather unproductive day. However, that is part of the life as a traveling standup comedian/economist – we spend a lot of time in airports. Today, however, has been a bit too much – particularly taking into account that my next trip will be on Wednesday. 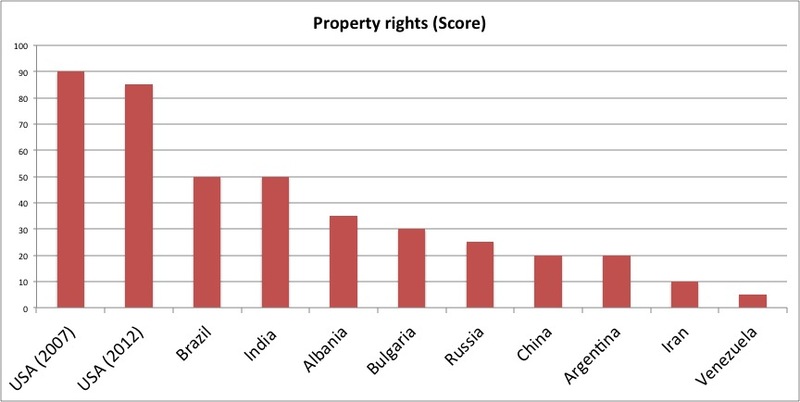 The purpose of my next trip is to go to Lithuania where I will be battling it out with Dr. Doom aka Nouriel Roubini. Nouriel and I have known each other for 6-7 years. We used to agree that we were heading for trouble and we also agree that the ECB failed on monetary policy. But fundamentally Nouriel is a Austro-Keynesian – a position that I strongly disagrees with. The Austro-keynesian perception of the world, however, is very common these days: During the later years of the Great Moderation we overspend and as a result we are now having a hangover in the form of repaying debt and therefore having lower private consumption growth and lower investment growth. It is not clear why we overspend – the Austro-keynesians tend to believe that it was a combination of overly easy monetary policy and “animal spirits” that did it. I think this story is utterly wrong, but nonetheless it seems to be the majority view these days. For the last four years Nouriel has been negative about the world. That to some extent has been right, but for the wrong reasons. Nouriel never forecasted that the ECB would fail so utterly – even though he correctly has criticized the ECB for overly tight monetary policy he certainly did not forecast how events played out. In general I am very skeptical about making heroes out of people who got it right in 2008 – whether it is Nouriel Roubini or Peter Schiff or for that matter myself and my ultra negative call on Iceland and Central and Eastern Europe in 2006/7. The fact is that most of the people who got it right in 2008 had been negative for years (including myself who turned bearish in 2006). Peter Schiff for example has been screaming hyperinflation for years. He has been utterly wrong about that. Roubini has been negative on the US stock market for years. He has been utterly wrong on that. I was right about being negative about Iceland, but the bullish call I made on Iceland a year ago or so actually has been much more correct than my negative call in 2006 (it took much longer for the crisis to materialize than I expected), but nobody cared about that because being bullish is never as “fun” as being negative. If all economists in the world throw out random forecasts all time some of them will be right some of the time. The more crackpot forecast you make the more spectacularly correct they will seem to be when they happen. Nassim Taleb even got famous for saying that rare events (“black swans”) happen and then a black swan event happened. Taleb didn’t forecast anything. But he is a celebrity anyway. Paradoxically the logic of his argument is that you can’t forecast anything and despite of that he is telling people how to invest based on this. I am proud of the few things I forecasted right in my life, but frankly speaking getting a forecast right doesn’t make you a good economist. The popular press was suggesting that Robert Shiller should get the Nobel Prize for forecasting both the bust of the IT bubble and the property market bubble. Please come on – that is not the work of an economist, but that of gambler. Robert Shiller is a clever guy, but I don’t think his biggest achievement is forecasting the bust of two bubbles – that is just pure luck (I had similar views to Shiller in both cases, but do not claim to be a great forecaster). Shiller’s biggest achievement is his work on what he calls “macro markets” and his book on that topic. That work has gotten absolutely no attention, but it is very clever and significantly more interesting than his work on “bubbles”. My friend Nouriel Roubini is a great economist, but my respect for himhas nothing to do with his bearish calls on the global economy. I, however, was a huge fan of Nouriel well before he made those bearish forecasts and before I ever met him. Nouriel has done amazingly good work with among others Alberto Alesina on political business cycles and the use of game theory in understanding monetary and fiscal policy. That didn’t make Nouriel an economic superstar, but it inspired me to study these topics. So I am forever grateful to Nouriel for that. So Nouriel see you in a few days. As always it will be great seeing you. We will argue and you will tell me – as usual – that I am overly optimistic despite my gloomy view of the world and my distrust of policy makers. But no matter what it will be great fun. See you in Vilnius! And if you haven’t been to that great city before I am sure I will have time to show you a bit of it.